Hey friends! Today I am soooooooo excited to be introducing a brand new series to the blog! I’m calling it Farmhouse Rehab and it’s all about helping you, my fabulous readers, design your own homes with farmhouse charm. I get a lot questions through email and social media from people looking for design advice. Maybe it’s your living room that’s got you stumped, or perhaps a bedroom that you’d like some input on. Whatever it is, I want to use this series to offer my ideas and suggestions for YOUR home. I’ve been dreaming of doing something like this for a while, so I’m tickled pink it kick it all off today. (I’ll share more about how you can submit your own space below!) Ok, let’s get this party started. I recently received a Facebook message from a sweet reader named Jess. She was looking for advice on decorating her Miami townhouse, specifically feeling a bit frustrated with her living room. The couch and TV console. I think both of these work really well for this small space and there’s no reason to change either of them. Curtains: I’d start by changing the curtains to something softer and neutral. The tile gives this space a cold feeling and the silky curtains only add to that vibe. I’d suggest something neutral colored, ideally white, which would compliment the fabric of the couch and brighten the whole space in general. 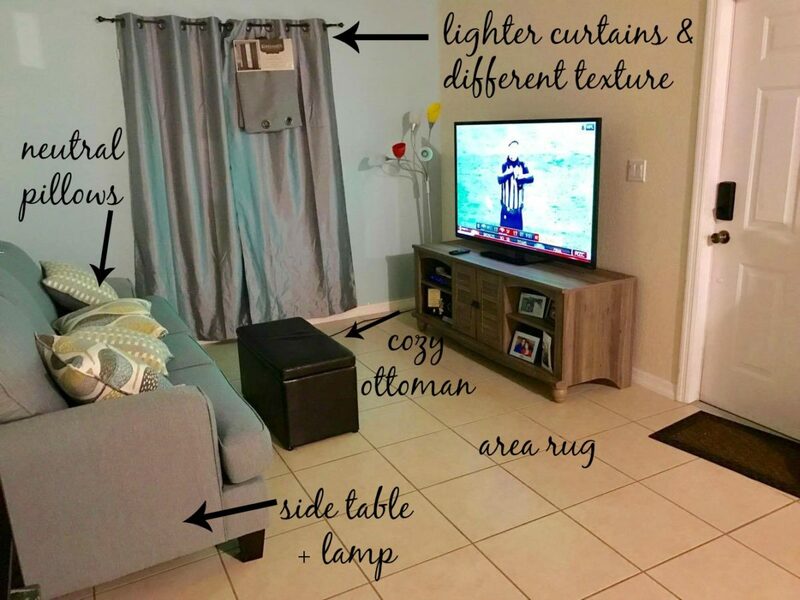 Ottoman: Since we’re dealing with a small space, I think adding in a light and bright ottoman would work perfectly to replace the current one that is dark leather. Even better if it has storage. Area Rug: If I could only change one thing about this space it would be to add in a cozy area rug. 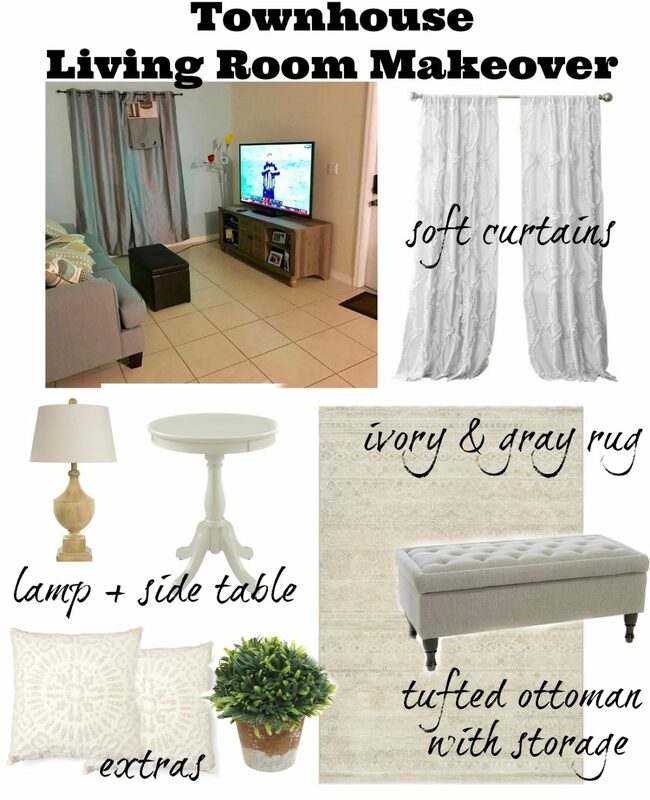 Since we are keeping the gray couch, I’d look for something that is cream or white in color with gray accents. I’d also avoid any lines or geometric shapes, such as stripes or diamonds, just so it’s not fighting with the lines/design of the tile flooring. Side Table + Lamp: I’d definitely invest in a small side table for the end of the couch. And since this isn’t a big space, I think one lamp will do fine to light the room. I’d replace the colorful floor lamp over in the corner with a really eye catching lamp for the side table. Extras: Adding in a few light colored throw pillows and a little faux greenery will definitely warm up this space. I absolutely love these soft white curtains. Aside from brightening up the room, they add some much needed texture and warmth to the space. Since it’s a small area, I wanted a solid pattern curtain that wouldn’t make the room feel too busy. The curtains are available here. Finding the perfect rug for this room was a bit of an endeavor. I wanted something that would not only compliment the color of the couch, but not fight against the light blue color on the back wall. Plus I wanted to be sure to avoid any geometric shapes or lines that would conflict with the lines of the tile. 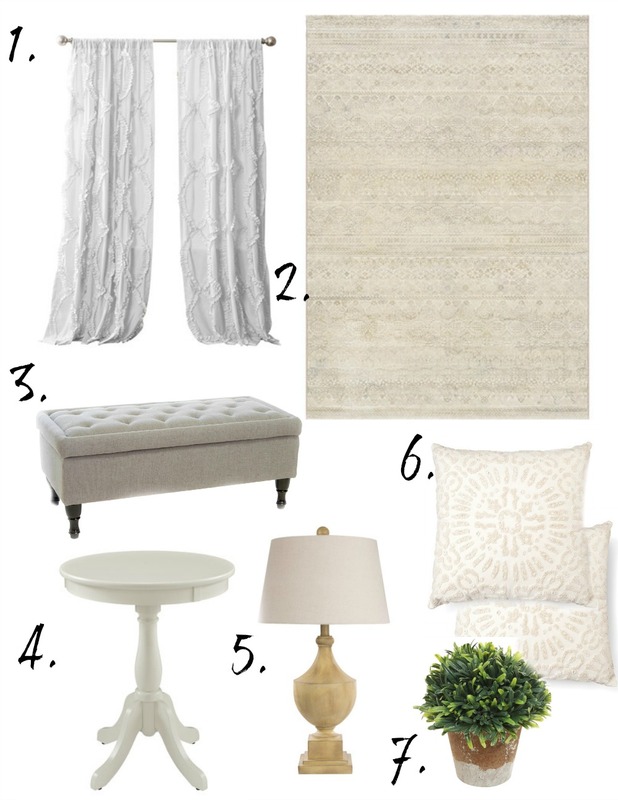 I think this ivory and gray area rug is perfect of this room. I suggest size 5×7 for this space. Rug available here. I adore this tufted ottoman. The color of the fabric works with both the couch and the rug, plus it opens up for storage. Find it here. This round side table works great in small space and it comes in several different colors. Available here. I chose this particular lamp because I feel like it makes a big statement. With it being a small room, with little space for extra decor, I wanted to find a lamp that would double as a source of light and a cool decor piece at the same time. It has an antiqued yellow finish, which you don’t see very often. You can find it here. The pillows on the couch look like they probably came with it when Jess bought it. I’d switch it up to something lighter to match the curtains and also brighten up the space. A soft throw blanket would also cozy the space up as well. Find these cream pillows here. Faux Plant, because every room needs at least one of these babies. Get it here. 2. Ivory and gray rug. Just a few changes and the right color/fabric combinations can really warm up this entire room with a cozy farmhouse feel. I think the rug will have the biggest impact on this space, but the change in curtains will also make a big difference. Aside from the soft white curtains I suggested above, I think drop cloth curtains would also work really well for an inexpensive alternative. If you’d like to get my input on a room in your home, just send me an email at [email protected] with the subject line FARMHOUSE REHAB. Be sure to include a few good photos of the space and let me know what you’d like help with! You’ll receive an email back if your space is chosen for the next feature! Now let me give you a quick disclaimer. I’m not a professional. I don’t have any design degrees or certifications. As I always say, decorating your home is very personal and you should always do what feels right to YOU. These are just my opinions and suggestions! Oh my goodness I love it. Ill be sending some pictures of our kitchen . For the past 3 years (ever since We moved in ) I have gone back and forth over painting the cabinets ….. I’m not a fan of the granite counter tops either but those are going to stay, no changing that . I can’t wait to get your input……and I’m still excited to see your house exteriors paint. That post is coming soon Marilyn! It’s on my to-do list to get photos done of the house so I can show you all the paint color we went with. We’re currently in the middle of a huge snow storm, so hopefully this weekend things will thaw out! And yes, definitely send in photos–I’m so excited for this new series! What a great feature! Your advice was doable and didn’t look too expensive! Can’t wait to see more! Thanks Gaye, I think this new series will be a lot of fun! What great ideas! I also love your idea about the drop cloth curtains. I have them in my bedroom and adore them. I’ll be sending you pictures of my great room, that I’m looking to rehab, that has a 2 story stone fireplace. I’m hoping you can help me! Have a great day. Oh yay! I’ll be looking forward to seeing your great room Andrea! So excited for this brand new series!!! Thank you for the inspiration! I’m excited too Sondra, I think it’s going to be a lot of fun! Painting this room the color of the sofa would also absorb it as the biggest piece of furniture. And of course, adding shiplap to that window wall (you did have a quick method tutorial on your blog) also painted would help. A couple of industrial metal pieces with shelves hung on both sides of window would strengthen a balanced space too. You can also order IKEA pillow covers online, utilizing the ones she has to save money, and easy change out seasonally. They have affordable rugs, which you’re right, would anchor the room beautifully! For someone that has a disclaimer that you’re not a pro, you acheive amazing results, and I’ve always believed, “experience is the best teacher” and you are experienced at bringing warmth to a home! Love your blog! I love all of your ideas Faith! Adding shiplap is always my first thought, but I wasn’t sure if she’s renting or not. That would definitely add a lot of character and charm to this room. Thanks so much for stopping by! Yay thanks Karly, so glad you like it! How about incorporating your drop cloth curtains in this space. Cheap and easy! I loved your post on those! Wow. You did such a great job. I would not hesitate to send you any of my problems. You will get lots of emails, I’m sure. Aw thanks Pamela, that’s so sweet of you to say! Oh that’s an AWESOME tip Erin. I should have suggested that! I just did that exact same thing in our dining room and it does make a huge difference in the look of the room. Love this idea, and love your suggestions! Good luck with it Sarah! Fun idea! 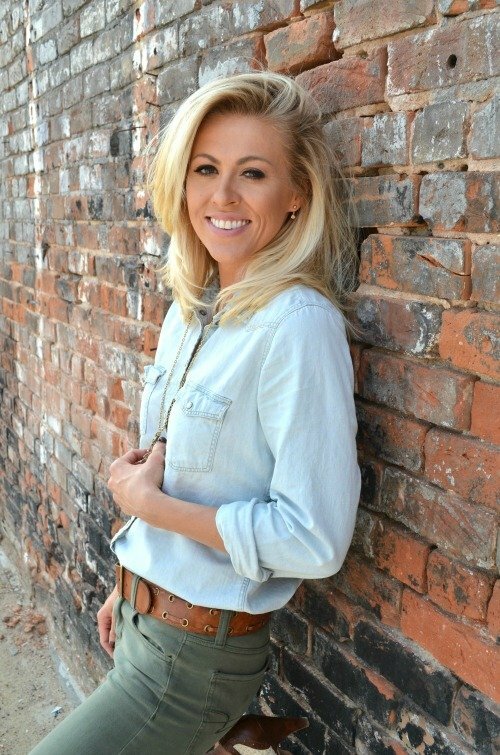 It would be great to see what Jess does with your suggestions! Speaking of drop cloths, I used some to cover a tired looking sectional couch and I am pleased with the results! Oh wow, that’s awesome Heather! I never thought of using them for a couch cover. Great idea! If she is handy with a sewing machine she could make a cover out of a painters drop cloth for the ottoman. I did that and love it!!!! That’s a great idea Cindy, I might have to try that myself! I’m going to love this!!! Great suggestions and can’t wait to see more! Yay! Thanks Donalee, I’m going to try to do it about once a month! Aw thank you so much Wendy, I appreciate that! Great ideas. I would love to see her completed space. I think it’s going to be great. Thanks Becky! I hope we get to see photos of the finished room too! I think your suggestions for her room were all great ones, and I definitely think this new feature on your blog needs to come full circle — we need ‘after’ pics of her room because seeing before and after pics will tell the whole story. Love your blog and everything you’ve done in your home. I live in a log cabin that is log inside & out and am slowly transitioning as much as I can to white-on-white farmhouse style with little pops of color thrown in because my husband is not a fan of white-one-white … yet. What an awesome series!!! I cant wait to read more. I’ve been adding hints of industrial into my decor. It’s a work in progress. My struggle has been working with a burgundy leather sofa. Recently I did score the Pottery Barn Andover media cabinet (red) and really helped pull the sofa together. New chairs aren’t in the budget this year ( our son is getting married) so making to with what I have. I recently found online a crank side table that will soon be mine. Making curtains for my sliding glass door and main living area using your drop cloth method is on my 2 week agenda. I cant wait to read more tips within your series!!!! I am looking forward to the upcoming postsof farmhouse rehab, what a great idea! I love your suggestions! I would love to know some cleaning tips for a family with small children, your pictures always look so neat and clean. I am so excited for this series! My house is nowhere near farmhouse style, which I’ve really come to love, and I’m having such a hard time finding ways to incorporate these elements in my own home. Love these suggestions and can’t wait to see the next one! Love your idea to start this series. It will be fun to see your ideas. I love, love, love that you added this feature to your blog. I look forward to all the “make over’s” to come. yay! So happy to hear you’re excited about it Chris. I’m really looking forward to it too!